This review is a bit different then normal. 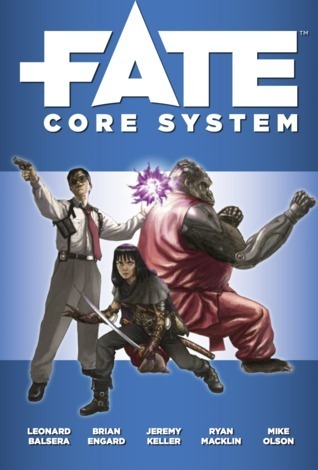 Today I review the Fate Core system book, which is a handbook to learn the tabletop roleplay game Fate Core. A High Priestess of the barbarian hordes, an undead Wild West gunslinger, and a Second Lieutenant of the Intergalactic Security Forces are about as different as they come, but they’ve got one thing in common: they need a strong engine to drive their stories. Fate Core is that engine. Fate Core is the latest evolution of the award-winning Fate roleplaying game system from Evil Hat Productions. We’ve streamlined and clarified the rules while maintaining the system’s trademark flexibility. Name your game; Fate Core can make it happen. I picked up Fate Core one fatefull evening. My boyfriend had been talking about alternatives to D&D and had mentioned Fate a few times. Then one evening I didn’t know what to do and I picked up the Fate Core book. and then i fell completely in love with the Fate roleplaying system and this book. I just finished reading this book for the second time in a month and every book that I can re-read in such a short period of time deserves a 5 star rating. Okay so I usually don’t review these kind of books I am going to give it a try :). While I never finished a D&D book I thought it was normal for roleplay game rule books to be boring and written dryly. Well as soon as i started Fate it was obvious Fate isn’t like that, the Fate Core book is well writen with humor and lots of examples that make you want to stand up and play the game now. It’s a fun book to read, while still being easy to understand. The explanations are really clear and the system is really neat and simple. There are some things and concepts I didn’t fully understand the first time, like boosts and how attacking and defending worked with different skills, but after re-reading those things became clear as well. There is an example game setting that is used every time they need an example and then you get a piece of tekst in italics where the session takes place and it illustrates the point the tekst was going to make. There are also some black tekst boxes with additional tips, extra’s or tips for the GM. The layout is really clear and i’s easy to find what you’re looking for, although both times I just read the book from beginning till end. The index makes it easy to look up a specific section you want to know more about or look up a certain rule you forgot. As I read Fate after only knowing the D&D roleplaying system it’s really difficult at first to let go of the things that make D&D and which I thought where universal roleplaying rules, well they are not. After I let go of those predetermined thoughts and opinions I could fully appreciate how awesome and neat the Fate system is. There are some core concepts and when you understand those you can adjust and hack the system to fit whatever you want. The nice thing about Fate is also that whatever you want to do, you can. You start with what you want and then think how you can use the Fate rules to achieve that. Overal the Fate system sounds like a fun and easy system and I can’t wait to actually try it out in a Fate campaign. You can adjust the system to whatever setting you want and on the internet there is a lot of information to be found from peopl who made their own Fate hack or setting / campaign based on the Fate Core system. To conclude: The Fate Core is a well written and fun book to learn the Fate Core system. The book is fun to read and the explanations are clear and there are example throughout the book to clarify things even more. I found it very easy to understand and reading this book (twice) made me really enthousiastic for this system and I can’t wait to play a Fate Campaign. I would recommend this book to anyone who would like to know more about roleplay and is looking for an easy to learn and easy to adjust system. I totally agree! I just started reading, but I actually like it so far! It’s not only informative, but also fun to read :). I really like that about the Fate book.